Abandon everything you've ever believed about that brittle concept we call "reality" and prepare to enter a macabre netherworld of shadows, fiends and phantoms - a twisted realm of waking nightmares and warped minds, locked away in unrelenting torment. Welcome to the Sanitarium. Behind the walls of the Sanitarium, Dr. Stenson holds dominion over the inmates of a most unusual asylum. LOS ANGELES, Nov. 13, 2013 - Image Entertainment, an RLJ Entertainment (NASDAQ: RLJE) brand, proudly announces the release of the horror/thriller Sanitarium . Directed by Bryan Ortiz, Bryan Ramirez, and Kerry Valderrama, the film stars Malcolm McDowell (Halloween, "Franklin & Bash") as the sinister Dr. Stenson. 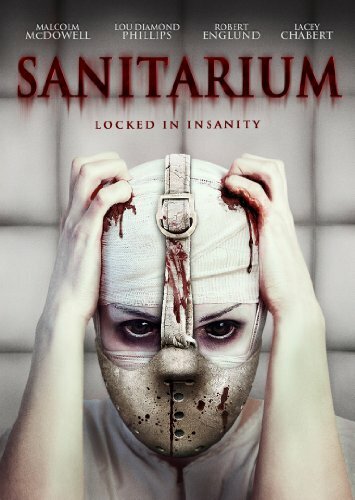 Sanitarium will be available on DVD and digital download on Dec. 31, 2013 for an SRP of $27.97. Abandon everything you've ever believed about that brittle concept we call "reality" and prepare to enter a macabre netherworld of shadows, fiends and phantoms - a twisted realm of waking nightmares and warped minds, locked away in unrelenting torment. Welcome to the Sanitarium. Behind the walls of the Sanitarium, Dr. Stenson holds dominion over the inmates of a most unusual asylum. Horror Legend Robert Englund (Freddy vs. Jason, A Nightmare on Elm Street) also stars with John Glover ("Smallville"), Lacey Chabert (Mean Girls) and Lou Diamond Phillips in three chilling tales of unspeakable terror that will drive you over the edge of reason - and beyond!